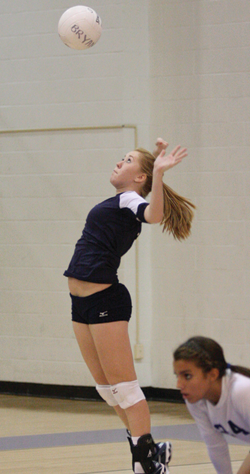 Senior Alyssa Micheletti serves in a volleyball match. Determination is an important value on and off the court, and one student who possesses that ability is senior volleyball player Alyssa Micheletti. Micheletti has been on the volleyball team since her freshman year, and she says the sport plays a significant role in her life. Although volleyball takes up a lot of time, for Micheletti, the pros outweigh the cons. Volleyball helps keep Micheletti in shape and helps her maintain healthy relationships with her teammates. While Micheletti may benefit from the team, the team also benefits from her. The players are not the only people who notice this drive in Micheletti. Volleyball coach Caroline Simpson said she sees a lot of good qualities in her. When it comes to getting her game face on, Micheletti is always on top of things. As for drive, Micheletti is also very active in the classroom. Many of her teachers notice her desire to excel in academics as much as her desire to do well in sports. When it comes down to it, Micheletti says she has gained a lot from volleyball, and thinks that learning to balance her time has been the most rewarding of it all.